LOWER recoveries and poor plant availability got Tharisa off to a relatively poor start to the 2019 financial year with first quarter chrome concentrate output coming in at 305,400 tonnes – enough to trigger an adjustment to full-year guidance. Concentrate output for the year will now be between 1.4 million tonnes (Mt) and 1.5Mt whereas the previous expectation was for 1.5Mt – surely the minimum as the company has an aspiration to be at 2Mt a year by 2020 in terms of its growth strategy. Similarly, on the platinum group metal (PGM) side, production would be 150,000 ounces to 160,000 oz instead of 160,000 oz. Phoevos Pouroulis, CEO of Tharisa, said in an announcement, however, that the company was on track to meet its 2020 targets. “We remain fully committed to our Vision 2020 targets and we are confident that the processes currently underway will see an improved performance in the months to come,” he said. The lower recoveries were expected for the first quarter as the company decided to minimise the impact of low ore availability by blending tailings with fresh ore so as to keep the plant operating to capacity. Pouroulis acknowledged, though, that the company under-estimated the downside consequences of this strategy. As for plant availability, the company was working through upgrades and maintenance of the machines which had restricted availability. It’s not all doom and gloom, however. The market is encouraging of the minerals Tharisa is producing, especially PGMs, excluding platinum. The average PGM contained metal basket price for the first quarter was $983/oz or some R14,050/oz representing an increase of 5.9% in dollar terms from the previous quarter, and a 7.5% increase in rand terms. Metallurgical grade chrome prices were flat in dollar terms at $164/t, and marginally lower in rand terms, but speciality chrome concentrates – which account for 23.6% of Tharisa’s quarterly chrome production – “… continued to attract a significant premium to metallurgical chrome concentrate prices,” the company said. Tharisa had a banner year in 2018. In November, it announced it would pay a two US cents per share final dividend for its 2018 financial year taking the total dividend to four cents/share, equal to just over a fifth of its net profit. “The maturation of the business beyond the development stage has positioned the group to implement the next phase of growth,” said Pouroulis at the time. For 2019, the focus will also fall on Tharisa’s expansion ambitions. 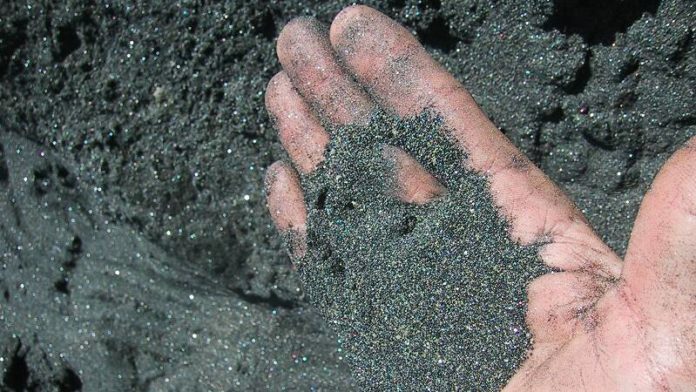 It last year bought interests in two properties in Zimbabwe: a 26.8% shareholding in a PGM prospect owned by Karo Mining for $4.5m and a call option on a 90% stake in Salene Chrome Zimbabwe, exercisable once Tharisa has paid for, and completed, an exploration study.